Sounds like a good week. I hope you enjoy your Wii Fit! I use mine in spurts :) And I love the pic you have posted. Did you create that? Congratulations on the weight loss! I too am loving the DDGbD CHallenge. I am a bigger fan of the NSV type celebrations. I mean I know we are all trying to lose weight, but I think more weight comes off if we focus on the other goals instead of being obsessed with the scale. Jessica - yes! 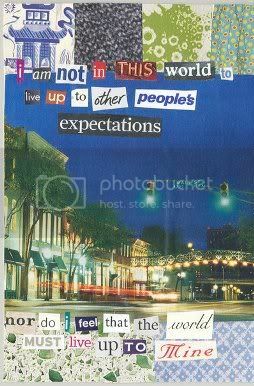 When I was an undergrad, I used to make art for people based on letters they wrote me - usually interesting images paired with quotes I put together out of cut-out words. I have tons more archived, I'll definitely post more in future entries!